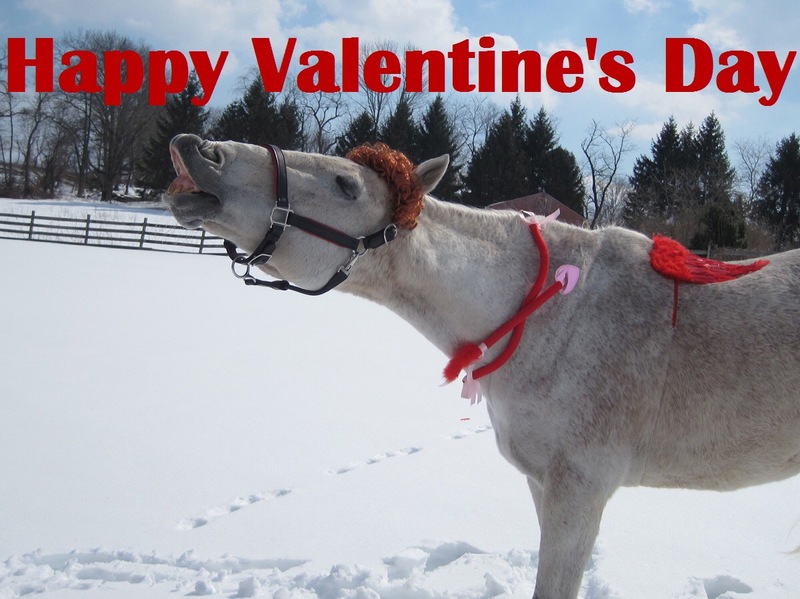 Okay, so I know you are looking at a picture of my horse dressed up as cupid making a face for Valentine’s Day and assuming that I am about to gush. And I am! But not in the way you think! The truth is, I am actually not that crazy about Valentine’s Day, or “I Love You” Day as I like to call it. As a single person, I used to detest February 14th (the only holiday in America that people spend more on is Christmas) and now, as a newlywed, I think my friends and family can attest to the fact that I gush about how amazing my husband is on a very regular basis (I came home last week to a fridge full of chocolate covered strawberries that he made me just because he loves me, no occasion needed. That sort of stuff happens often and reminds me how lucky I am) so I don’t feel the need to go on and on about it today. I decided that instead of gushing about romantic love, I want to take a moment to talk about the love between a girl and her horse. Everyone reading this knows that is a special kind of love. I talk a lot about how much I love Gen, but I don’t often talk about the ways in which my horse loves me. In fact, I often joke that Gen doesn’t love me at all, but I know that isn’t true. My pony shows many ways in which he loves me, and knowing he does makes me feel like the luckiest girl in the world. Gen may not be always to be around easy or particular affectionate, but I am his person. I am sure some people may think I am crazy, or maybe just that I am anthropomorphizing, but I really feel like it is love. 1. I hug him and he lets out a big sigh, licks and chews, closes his eyes and leans up against me. He reaches this level of contentment that lets me know that he trusts me completely and that he feels protected and loved in my arms. 2. He comes running over to me when I get to the barn. I thought he did it to everyone, but I found out that, he does come over to just about anyone who comes to see him, but the only person he gallops to the gate for is me. It doesn’t happen every day, and I know having a Thoroughbred gallop towards you at full speed may not be what everyone wants, but I love it and it makes me feel like feel like Gen has been thinking of me all day and can’t wait to see me. 3. He doesn’t feel good or is hurt and I go rushing to the barn and he hears me before he sees me and he lets out a huge nicker. I may not be able to make him feel any better, but knowing he is talking to me as soon as I get there makes me feel like I am all he wants when he doesn’t feel good. 4. When I bring someone to the barn and need to step away for moment, the second I walk out of his line of sight he gets super fussy and looks around for me. He will even whinny and cry for me (which is not something he does if he is in alone and I am there). It makes me feel like it isn’t just that he needs attention, but rather that he needs MY attention to make him happy. 5. When he lets me kiss him on the nose. Gen HATES getting kisses on the nose, but he has this sweet copper colored marking right on the softest spot. He will let most people kiss him on the forehead, but I am the only person that he will let kiss him on the nose. Letting me do something because he knows I love it even though he hates it? Now that is love. So how do you know that your horse(s) love you? Is it something you horse does or something about the way they make you feel? What is it about a horses love that just makes everything better? This entry was posted in Gennyral, Horse and tagged Horse, horses, valentines day. Bookmark the permalink. This is sweet. I’m not a fan of the Valentines day thing either but more of the day to day things. Gen is a sweetheart who loves you. I’m not into Valentine’s Day either. Your husband sounds like a great guy. I’m happy for you. I don’t think I have any horses that love me anymore like Gen does you. They only get excited when they see a feed bucket or carrot. My heart horse Erik died about nine years ago but he sounds exactly like Gen. He used to nicker and give kisses if I asked for them and horse hugs. Dusty couldn’t be bothered to be nice unless there was something in it for her. So enjoy Gen while you can these kinds of horses don’t come into our lives often. Give him a kiss on the nose for me! We aren’t fans of Valentine’s Day either. We do sweet things for each other throughout the year, little daily things. They mean more than a box of chocolates once a year. There is a special love between a girl and her horse. I know I feel it with both Tex and Lucy.